Welcome to Willen Lake, Milton Keynes’ most popular park. With activities for all the family on and off the water, there’s something for everyone to enjoy in our beautiful setting. Find out everything that is going on at Willen Lake including watersports courses and sessions, kids activities, Treetop Extreme sessions, Splash 'n' Play and upcoming events. We offer a range of different activities for all ages and abilities. Whether you want to have fun and relax or learn a qualification, we've got something for you! 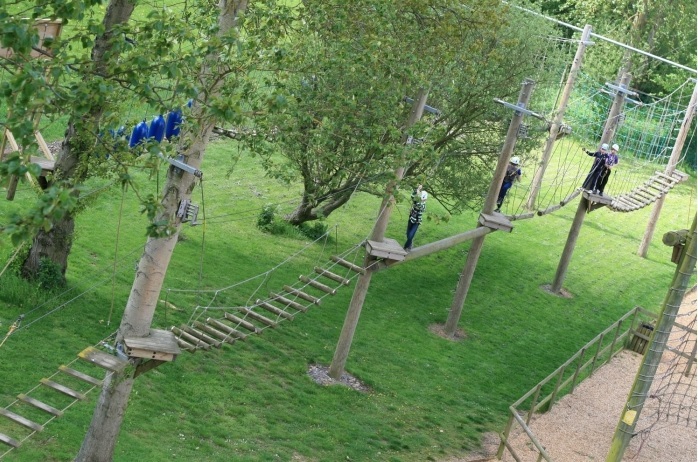 If you fancy something a little different, why not book a family Treetop Extreme session? Explore our activities section and find out about the land based activities we have to offer! Click to find out more about our party and packages options. Land or water, we have you covered for a great experience! This year our Treetop Extreme High Ropes course at Willen Lake was shortlisted in The Adventure Awards ‘Best Team Building Activity’ category. The award-winning FriendsFest arrives in Milton Keynes for a 25th anniversary tour, in partnership with The Luna Cinema, with brand new and exclusive activities and merchandise! Willen Lake has launched a new online order system for its popular gift vouchers, which makes buying a treat for the adventurous watersports fan in your life even easier. Willen Lake is managed by self-financing charity The Parks Trust, which cares for over 6,000 acres of parkland and green space across Milton Keynes. The Parks Trust also works with around 6,000 school children and adults and approximately 200 volunteers. It organises and enables over 500 events each year, making Milton Keynes a vibrant and colourful place for everyone to enjoy.